When it comes to our priority for apps that we’re using on our mobile devices, speed is almost always the controlling factor. It’s why UC Browser has a growing reputation as one of the fastest available mobile browsing options available on your smartphone, but that doesn’t explain why it might be limited to smartphones, foregoing the potential install base of Windows PC users who’d love a copy of UC Browser for their computers. In lieu of having a version of UC Browser that works for Windows PCs, we once had two options—find a workaround, or look for alternatives that come with the same or similar features that make UC Browser good in the first place. Thankfully, the old workaround that many once used is no longer necessary. UC Browser has been released for Windows PCs, but we won’t skimp out on the topic by failing to show you some strong alternatives, either. By the end of this guide, you’ll have UC Browser up and running on your computer, and you’ll also understand why it’s in such demand. Considering how large of presences Google and Apple have become in the US, you might be surprised at just how popular UC Browser has become, considering it was developed by Chinese-founded company UCWeb. Asian markets are where it’s booming most, but the regional demographic that’s getting the most use out of it only accounts for a portion of its popularity—the rest has to do with its most compelling features, which haven’t yet taken root in other mobile browsers. The most-desired of those features is most certainly UC Browser’s ad-blocking potential. Online advertising is in a tricky place, and it’s more or less the consumers and people browsing the internet that have obfuscated the issue to the point of “no resolution.” Advertising—whether it shows up as banner ads or pop-ups—is responsible for a great deal of internet traffic, routing, and overall online revenue. A majority of users claim to hate online advertising with a passion, but it wouldn’t continue to be so successful if people weren’t clicking on those ads in the first place. This conflict of argument is part of the reason that browsers like Chrome and Safari don’t support ad blocking, while UC Browser has gone and capitalized on their inaction. 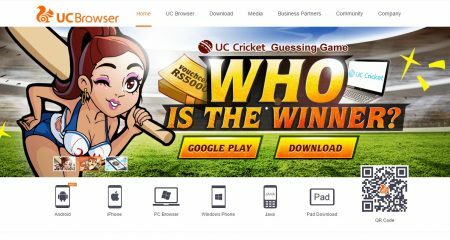 UC Browser’s mobile features aren’t entirely unique, but most of them are useful, and quite a lot of them have made the migration to the Windows PC version of the browser. Compared to other web browsers, UC Browser retains significantly more data while you’re browsing the web, which can ideally help users in a couple of different ways. First, it allows often-visited web pages to load faster—the data is already cached, and as long as the website version hasn’t changed, that load speed is going to be lightning-quick. Secondly, UC Browser is excellent at mobile optimization, which once again speaks to how quickly it works, but also means that web activity through the browser will consume significantly less data. Much of this is a result of where it was developed. When UC Browser first became popular, the countries it was used in didn’t support the massive, fast, and relatively accessible mobile networks that we’re used to in the US. Therefore, everything was slower, access was more costly, and everything about mobile browsing was more limited. These scenarios are what led to UC Browser’s innovation, and accounts for many of the reasons that it’s still popular. Apart from some of the features that make much more sense on a mobile device—mobile optimization, a QR code reader, 3D touch support for iOS—most of the features that make UC Browser good are plenty available on Windows. Simultaneous downloads, data compression, and an add-on store that’s flourishing are all features that users are accustomed to seeing crop up in other browsers, but UC Browser has been working on them for years. Thankfully, the Windows version of the browser runs natively, which means that we no longer have to use emulators in order to get it up and running on laptop and desktop computers. Even though that was a fairly simple process, it always resulted in another layer of software being between users and their internet access. Your first stop is going to be the UCWeb site, where you’ll find download links to every version of UC Browser. Click on “Downloads” at the top of the screen, and you’ll be brought to a list of supported platforms for the browser application. Surprised? It supports just as many operating systems as Google Chrome or Mozilla Firefox (both of which will get special billing in out “alternatives” list, below). Apple iOS, Google Android, and even less used operating systems like Windows Phone, Blackberry, and Nokia are able to use a version of UC Browser. Windows is where it’s at for us, though. so click on the appropriate link, and it should start a download of the installer application. Alternatively, you can grab it from the UC Browser for Windows website, which lists further details about the browser itself. The installation process should be a cinch; just as easy as installing any other web browser on your computer. Afterward, you can boot it up, and start browsing! There are no extra workarounds needed, and no barriers to your browsing experience. Of course, many of the same tips and tricks that you’d use on the mobile version of UC Browser can also apply to the Windows PC version. On top of that, you’ll see added benefit if you choose UC Browser as your mobile app of choice due to the cloud syncing that occurs between versions of the app that you’re using. Explore add-ons: Much like the Chrome browser’s extensions, UC Browser has a flourishing market of apps and add-ons that can give UC Browser greater versatility. Once you’ve learned your way around the app, check out the marketplace and see if anything catches your fancy. Trust your downloads: smart file management means that even if one of your downloads is interrupted (and you can download many files at once), you can always resume it as long as you have access to the original source. Never fear random disconnections, again! Cloud syncing: Want to pick up where you left off on the mobile version of UC Browser? As long as you’re signed into your profile, all of your activity across all versions of UC Browser will be synced, meaning that you can work and browse efficiently no matter where you are. Of course, much of UC Browser’s popularity has come about from its longstanding reliability. It was born out of necessity in regions that needed the features that it was offering, and the user base that it developed is quite loyal to the platform. If you need a comparison point, check out Apple’s evolution over the past several years. However, that doesn’t mean that other web browsers aren’t actively competing with it. If UC Browser isn’t up your alley, check out one of these excellent alternatives that have support for similar features. The more that I use Opera, the more that I’ve come to enjoy it. Like UC Browser, it’s supported across a wide variety of popular operating systems, and also like the featured app of this guide, it supports cloud syncing across multiple devices. It also features top-notch ad-blocking support and some of the least intrusive mobile optimization that I’ve ever seen. Oh, and if you need comparisons to UC Browser to get even closer, it also performs data and media caching that will significantly lessen your load times for videos and frequently visited web pages. Mozilla Firefox has always had something of a reputation for being a renegade. It’s had excellent privacy-support features and has always valued its users’ experience over profit. For longtime users, this is probably made obvious by the fact that it’s always been free to download. The mobile version is excellent, too! It’s not as fast as Opera, and it’s not as widely used as Chrome or Safari, but it’s far from being an actual underdog; it has millions of users, after all! Because it’s been around for quite a while, it also has broad add-on support in the same vein as UC Browser or Google Chrome. One of the joys of living neck-deep in the digital era is having such a wealth of choice in how we carry out our online tasks. Choosing our hardware, software, mobile devices, web browsers, and mail clients doesn’t just consist of finding “the best” as much as it means finding the things that best suit your needs and wants. UC Browser is popular because it catered to the needs of a specific demographic at a certain time, but it turned out that those features were hugely in demand across the digital landscape. Hence, it’s now easy to download UC Browser and achieve a similar experience on your Windows PC. If you have any questions about using UC Browser on your computer, let us hear them in the comments below!